The second best thing (next to my custom golf cart wheels) I love about my "new" refurbished golf cart is the golf cart enclosure. You can spend some serious money - a couple of hundred dollars on this important accessory and you want to do it right the first time. 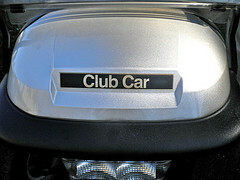 These covers can be universal - meaning it doesn't matter if your golf cart is a Club, a Yamaha or an EZ Go. 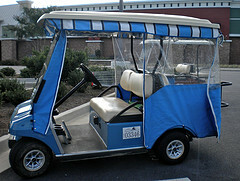 What matters is the length of the roof - whether it is a 2 person golf cart or a 4 person golf cart with an extended roof. A universal enclosure has limited options - usually the only color options are going to be a beige or white. Or you can get a more custom enclosure that is specific to your make and model. These of course cost more but you also can customize the color - from red, black, green, blue etc. The canopy that goes around the roof - like the red, black and white stripes that are in the picture - also comes in a wide variety of colors and patterns. Since this enclosure sits over the roof of the cart, there is no need to be concerned about the color of your golf cart roof as the enclosure covers it anyway. Our custom Sunbrella enclosure was easy to install. The windshield needed to be removed to get the cover attached on the front struts, but it was pretty easy to do. Some people prefer the look of the track system. It does not go over the roof - but rather the track system goes along the underside of the golf cart top. 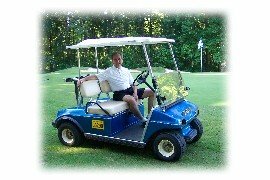 Some of the custom golf carts have special colored roofs and maybe the owners don't want the top covered. These tracks can be installed by the owner or by a local golf cart dealer. However, installing the tracks requires some time and effort and certainly not as easy as putting the cover over the top. 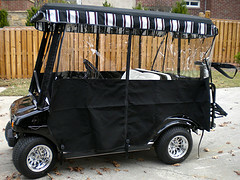 Either way having a golf cart enclosure is one of the best golf cart accessories to have. I went to pick up my granddaughters on a cold rainy day and we kept dry and warm thanks to our new cover.